Naturally I chose Dragon Magick. 😀 Now I just have to find all the info I need either online, in books and through meditation with my Dragons and gradually add it all here. …though my ideas could change at any time. As for crystals and herbs …I believe they too are quite subjective and would depend on personal preference, availability and what one is intuitively guided to use at the time. In short, there are no hard and fast rules about what one “should” use. 14th October 2014 ~ I found a burst of enthusiasm again recently for this project so it’s moving along gradually. 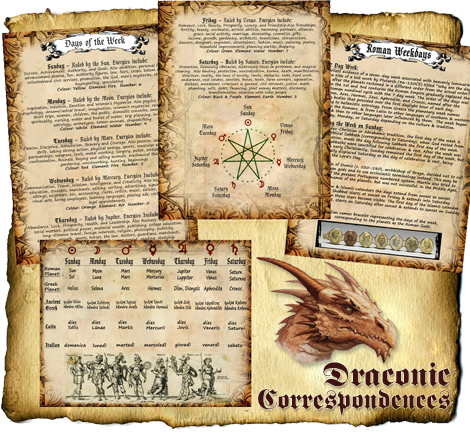 🙂 I’ve started the sections about Colours, Crystals, added some previously prepared pages about Dragon Deities etc and have added a couple of extra Dragon names to the directional/seasonal correspondences section. However, apart from my own personal Dragons whom I have met through meditation and subsequent rituals, I really don’t relate to any of the others, including those in the Planetary list. 13th December 2014 ~ Well, it’s crunch time and this assignment is far from finished and “due” tomorrow. Progress has been sporadic as I find my time split amongst far too many interests, projects and general mundane duties :::sigh::: I’ll get back to it and add more eventually. Feeling physically and emotionally drained at the moment.